Q: What type of work are you involved in and what is your expertise? A: Before distribution, there are a lot of controls on water in order to guarantee it is safe and sustainable. For this reason, our lab acquired top-notch instrumentation for micro-contaminant analysis – both regulated contaminants in existing legislation and emerging contaminants. Using HPLC coupled to Orbitrap high-resolution accurate mass (HRAM) MS, we can perform analyses on various classes of pesticides and emerging contaminants like Perfluoroalkyls at ppt levels by direct injection, without any derivatization. Q: Is the Thermo Scientific Q Exactive Focus MS living up to your expectations? A: The Q Exactive Focus MS proved to be a powerful and reliable instrument, meeting all our expectations, especially concerning non-target retrospective analysis. This is the field where Q Exactive Focus MS can make the difference compared to other MS detectors. Moreover, the user interface is simple and intuitive and setting up an instrument method is quick and easy. The instrument can be approached easily by people that are not particularly confident with HRAM techniques, provided they have some training about basic settings. Q: Are you confident that Orbitrap mass analyzer technology can be used as a screening and quantitative two-in-one MS instrument? A: I am fully confident since it is just what happened in our lab. The Q Exactive Focus MS is working day and night performing routine analyses but its benefit is that it can acquire data in full scan mode with enough sensitivity to comply with our limits of quantification (ppt level). This allows us to store a lot of data related to our samples since all ions, of an established range, that enter the detector are collected and recorded. 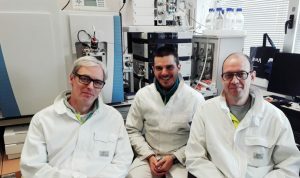 Thus, the instrument can perform a kind of “snapshot” of the sample from which the masses of the investigated analytes can be retrieved in retrospect. Routine analysis can be easily coupled to retrospective screening. Q: How has Orbitrap mass analyzer technology impacted your lab organization? A: Measuring the exact mass is a valuable tool for categorization, identification and verification of many organic compounds as it adds another discriminating factor beyond standard time-elution and single-Dalton resolution. Performing analyses with such mass accuracy allows us to speed up our routine analysis, since there is no need to perform further investigation on samples in order to check for possible false positives. Moreover, the possibility to acquire spectra in full scan mode gives us the opportunity to store a large database consisting of many spectra for retrospective analysis. The presence of a possible emerging contaminant can be detected quickly on historical samples with a fast “yes” or “no” response. 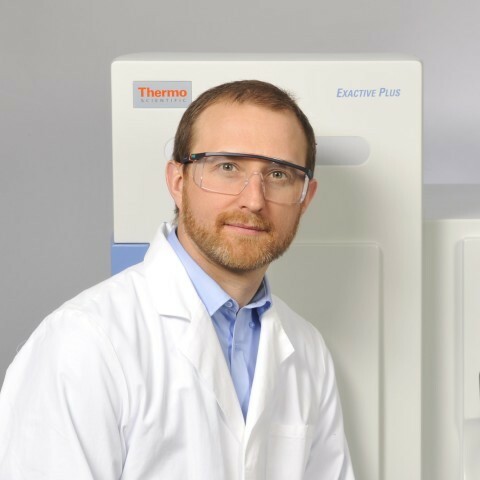 Q: How do you see the future of Orbitrap mass analyzer LC-MS analysis in environmental analysis? A: I think that Orbitrap mass analzyer can be a complete benchtop instrument that can satisfy a wide range of analytical requests, from routine analysis, to non-target determination, up to research purposes. It shows similar performances to those of triple quadrupoles and it is based on same principle of measurement (especially Orbitrap mass analzyer versions equipped with collision cell) but it has more useful features. Q: Would you recommend this technology over other HRAM to other environmental labs? A: Yes, for sure we recommend it! It’s a really powerful instrument. It is really robust and easy to use. Especially since the Q Exactive Focus MS can be used as a triple quadrupole spectrometer (since it has a collision cell) with comparable sensitivity but with the advantage of being capable to operate in full scan mode at that sensitivity. This is a plus concerning retrospective analysis and ease of instrument method set-up. Moreover, being a high-resolution spectrometer, it is capable of separating mass fragments at the fourth or fifth decimal place (exact mass) where triple quadrupoles are limited to single-digit mass units (integer mass). That minimizes the problem of false positives considering that masses are determined with high accuracy (3 ppm of mass unit without lock mass). Federico Dall’Acqua, thank you for this very insightful interview on how your laboratory uses the Orbitrap mass analyzer technology for screening, quantitation and non-target retrospective analysis at your local water and wastewater treatment facility.